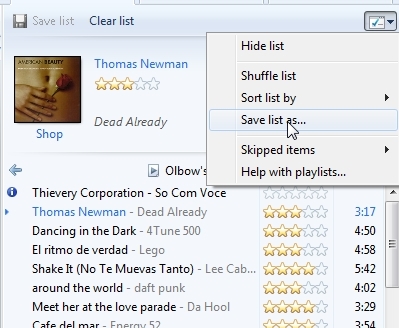 Now second problem to solve : impossible to drag and drop wpl playlists to iTunes.?? Here is the solution :??http://www.tech-archive.net/Archive/Media/microsoft.public.windowsmedia/2008-01/msg00046.html?? Basically : just need to double click on the wpl playlist to put it in the playlist zone and then select “save as” and choose the m3u format, which is dead simple to import in iTunes (see pictures and my previous post :??http://olbow.posterous.com/migration-from-windows-media-player-to-itunes)?? I started recently to migrate all my songs from Windows Media Player to iTunes.?? The most difficult part was for me to migrate the m3u playlists. I searched quite a long time for the solution to import them into iTunes via the menu or to convert m3u into xml files and actually it is as simple as to drag and drop the file into iTunes (still not very much used to Apple).?? So if you need to import m3u playlists in iTunes, just open a file explorer and drag and drop the m3u playlist in the left column of iTunes in the playlist zone.? ?